If asked you to guess the biggest design controversy in history, a logo or packaging design fiasco is likely to come to mind (especially nowadays). If we’re considering impact, though, then the design in question is less likely to be a consumer good and more likely to be a public one — for example, the New York City subway system map. Specifically, the New York Metropolitan Transit Authority’s decision to replace Massimo Vignelli’s 1972 design — a clean and abstract (though far from geographically accurate) tool that was beloved in the graphic design world — with a less abstract, more geographically accurate one, has produced a good 40 years of hot debate. Vignelli is still bitter about the issue, and is still offering alternatives — along with many other NY design firms. The subway map is one hell of a design problem that has produced some staggering elegant solutions. In this post, we’ll look at a handful of subway maps that range in complexity, abstraction and style. We’ll also look at the evolution of 2 major subway map designs, the one for NYC and the one for Moscow. Finally, we’ll consider 3 incredibly complex subway systems — the ones for NYC, London and Tokyo — where unofficial, alternative designs may be even more popular than the official ones. Many of the images below will be accompanied by Neil Freeman’s subway map abstractions, which are geographically accurate and at the same scale, to give you a better idea of how the systems vary. The debate rages on: what is more helpful, a super abstract and schematic map which tells you how to get from point A to point B but bears no concrete relation to the actual geography of the city (and thus may prove confusing for those who do think geographically), or a more detailed, geographically accurate one that meshes with your preexisting sense of direction? There is no overarching answer — it depends on how complex the system is, how big the area and how important the geography of the area. The following 6 subway maps, ranging from most to least complex, illustrate the issue nicely. Berlin’s and Paris’s subway systems are quite complex. As a result, a certain degree of abstraction is necessary for the result to be legible; the designs stick to straight lines and regular angles and compress or decompress distance as necessary. This is clear in how the shape of the Berlin subway map, which is a fairly neat rectangle, differs from the actual scale of the city, which as you can see is larger and more irregular. Mexico City’s and Boston’s subway systems, while still fairly complex, are less than those of Paris and Berlin. It’s for this reason that the Mexico City subway map is able to introduce some more complexity without losing legibility. The subway lines are crooked rather than perfectly straight, reflecting the actual geographic layout of the lines. The map also includes the layout of major city streets in grey, to help a viewer understand the placement of the lines. Boston, despite being a relatively simple system as well, nevertheless remains quite abstract, which allows it to work in extra information like the placement of bus lines and commuter rails. San Francisco’s and Melbourne’s maps are the simplest of the bunch. SF’s BART map is thus able to be fairly geographically accurate (although you can see discrepancies between the map and actual scale in how far the ends of the lines actually extend) and is able to include extra information like the presence of mountain ranges and bodies of water — geographic landmarks that are very familiar to Bay Area residents. Looking at the above maps, it’s clear a certain style is prevalent: birds’ eye view from directly above, white backgrounds, primary colored lines that meet at regular angles. Check out how the unique subway maps for Stuttgart, Montreal and Lisbon differ. It’s particularly interesting to see how a single subway system addresses these issues of how to represent complexity, geography and scale as it grows and evolves over time. For a little Cold War throwback, we’ll look at 2 of the world’s most unusual and complex subway systems, Moscow’s and New York City’s, and how their maps evolved from the 1940s through the present. Here, we see a more archaic form of cartography (1947), which contains landmark emblems in order to help guide the viewer, evolve to adapt the prevailing language of subway map design, including primary color lines and no pictorial information (1967). This map becomes more and more abstract, reaching its peak in 1979 with an image that consists of a perfect circle intersected by 6 perfectly straight lines, bearing little relation to the real geography of the area. In 1990, some complexity is re-introduced, and this trend continues up until the planned future 2013 map, which shows kinks in the lines as well as major city streets. This progression makes the Vignelli controversy clear as day. The 1948 map, geographically accurate and quite difficult to read due to the system’s complexity, was replaced in 1959 by a much more abstract design and then in 1972 by Vignelli’s abstraction with clean right angles, which is extremely elegant and legible but further from the city’s real geography. The current design is a return to the geographically-grounded 1948 style, just a little cleaner. In recent years, graphic design firms have decided to quit griping about subway designs they disagree with and just design their own version instead — often to be sold as a collector’s poster. Other firms, seeing physical maps as a thing of the past, have gone digital, producing a new breed of interactive maps which introduce new information, functions and design issues of their own. Londoners are some of the proudest subway (or as they call it, “the tube”) travelers in the world. 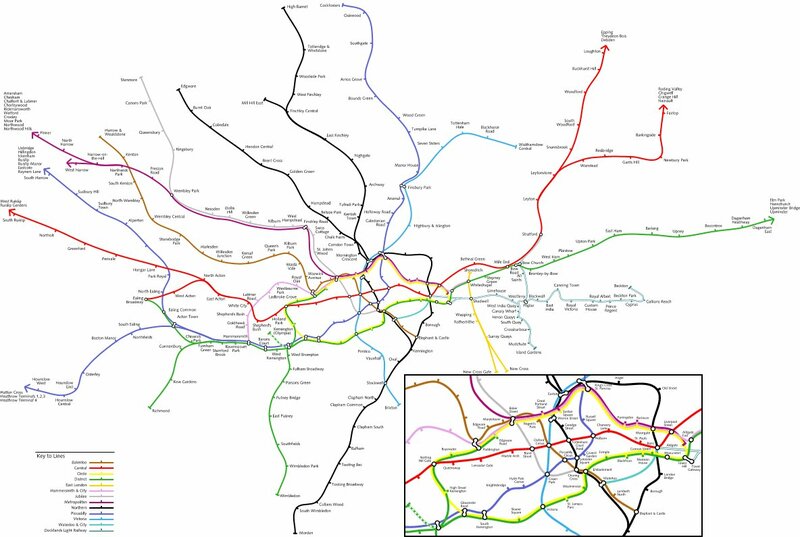 The tube map, originally designed by Harry Beck, has become a city icon. This has not stopped Londoners from toying with it in a number of playful and helpful ways, however. Check out the alternative versions below. This one, by Simon Clarke, gives a geographically accurate rendering. 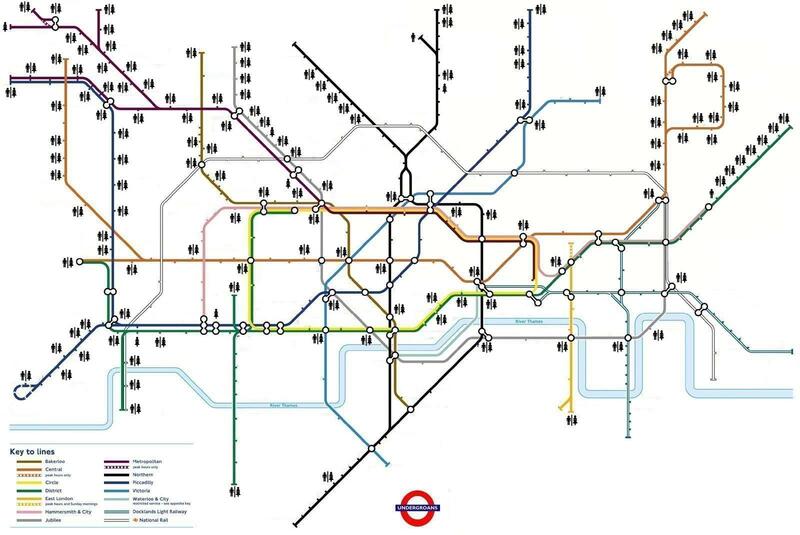 It’s huge, showing why the spatial compression of the official Tube map is a necessity. In this one, you can see a series of dotted line paths connecting certain stops. Those indicate where it’s actually faster to walk than to take a crowded subway. Called the “caught short” map, this one lists all of the stations that have public toilets. Perfect for drunk travelers. As mentioned in the introduction to this blog post, the New York City subway map is an ongoing point of contention, and a variety of alternatives have cropped up to address what is often seen by the design community as a highly unsatisfactory official version. Check them out. Vignelli himself is still at it, frequently designing modified versions. This digital one, called “The Weekender,” it reflects planned service changes in real time. Eddie Jabbour created what he calls the “Kick map,” which attempts to improve upon the original Vignelli design by making transfer spots more obvious as well as more clearly delineating the many lines that run the length of Manhattan. Triboro created a highly abstract, easy to read map in homage to the Vignelli approach. They took it one step further by making it monochromatic. South Korean firm Zero Per Zero created this playful map, inspired by Milton Galser’s iconic “I ♥ NY” design. The TripTrop app does not show actual route lines, but rather prompts you to input your location, and then produces a map reflecting the amount of time it would take you to reach other zones of the city by subway. We selected a random spot in Greenwhich Village. The red zone is accessible within 10 minutes, the orange within 20, the yellow within 30 and so forth. Tokyo’s subway system is perhaps the most complex in the world. Trying to represent that tangle is a tough project, but a few firms have tried their hand at it. Vollmer creating a map that thins out the lines a little and spreads them over a larger space, making for a more legible online map. Zero Per Zero, which created a like design for their native Seoul, produced this beautiful, undulating map of concentric circles oriented about the Imperial Palace. It’s pretty enormous — too big to be practical — but as far as aesthetics go it sure is a lot easier on the eyes than the official version. What does the subway map in your city look like? How would you change it?